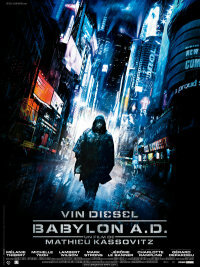 Teaser #2 Drops for scifi actioner Babylon A.D.
A second teaser trailer has dropped for Mathieu Kassovitz's Babylon A.D. and, while we don't like to go overboard and report on every bit of promotional material for films, we decided that it was different enough to get excited about. Decidedly shorter than the first clip, this teaser showcases some pretty slick, Matrix-style FX shots that we were absolutely not expecting from what appeared to be a more down and dirty dystopian parable. Not that we're complaining or anything... though we are very curious to know you guys and gals think so check out the teaser in glorious HD after the break. Shout out to our buds at 24fps for the find.